The pound has fallen to a 31-year low against the dollar as fears over Brexit continued to spook investors. In late afternoon trading the pound stood at $1.2649, down 0.8%, after touching its lowest point since 1985 earlier in the day. Sterling is down more than 2.5% this week since the prime minister said on Sunday that she would trigger Brexit negotiations next March. 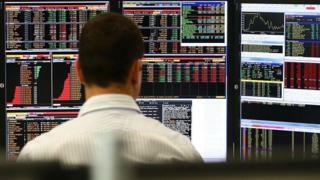 The FTSE 100 closed down 0.5%, or 33.29 points, at 6999.96. That is just off the high of 7000 surpassed earlier this week. Against the euro, the pound was down 0.2% at €1.1327 after falling to another five-year low earlier in the session. The currency has fallen on worries that the UK will be prepared to leave the EU single market as part of the Brexit process so that it can impose controls on immigration. Connor Campbell of spread-betting firm Spreadex said: "We are firmly back in Brexit-dominating territory - even the mildest squawkings from the news-wire are causing pain for the pound." He added: "Today it was the turn of Angela Merkel to make sterling's life even more difficult, the German leader resolute in her claim that freedom of movement is a must if Britain wants to stand any chance of remaining in the single market. Currency concerns affected the stock market, with airline Easyjet worst hit after it warned the weak pound would cost it £90m this financial year. Easyjet closed down 6.93% in the wake of the announcement, making it the biggest loser on the FTSE 100 share index. The biggest winners were travel firms TUI, up 1.35%, and Carnival up 1.22%.